AOR/Hard Rock band BUGZY hail from New Jersey, USA. They band was active from 1985 until 1995, recording over 80 songs during that time, but never landing a record deal, despite label interest. Divebomb Records picked up their material recently and is releasing the debut 17-track album here titled “Plan B.” I always find it interesting during these golden years of the genre why some bands got signed and others didn’t. Talent goes a long way, but we all know many talented bands who have never been signed, and vice-versa. Nepotism is probably a factor as well, and Timing can surely come into play. Of course, the Grunge years were not kind to the AOR/Hard Rock and Metal genres after 1991. I am happy for the band to finally be able release the material they worked so hard on composing, but in the 20-30 years that have passed since, I wonder again about the timing. Let’s find out what BUGZY is all about. After a long listen to the album, it’s clear that they have all the ingredients for a recipe of success…easy-listening riffs, a strong front-man, melodic sensibility, and they are talented musicians to boot but do not overly indulge in musical pyrotechnics. You could compare them to any number of successful bands during that time, like AUTOGRAPH, HURRICANE or even NELSON, BAD ENGLISH or DAMN YANKEES for example. They had the hair and the outfits on point as well, but were not overly focused on their image. What we have is a pretty good collection of fast rockers, slower ballads and some songs in between. What is maintained throughout is a strong sense of feel-good chord progressions and a flair for harmony to keep the music easy to understand and fun to listen to. Truthfully it was as good as anything else you would have heard during that time, but does lack some of the “big punch” that other bands employed during that time, especially in the choruses. Their best moments? The jovial melody and tender touches in “Say a Prayer;” the memorable message and harmonies in “A Glimpse of Paradise” (including a really great guitar solo), the emotional quality of “Lies,” which is both energetic and tender at the same time, the acoustical guitar parts in “Don’t Ever Let Go,” with a melody that sounds like something you might have heard from DEF LEPPARD, the big melodies in “The Bigger the Heart,” which remind me of bands like TRIXTER or even DANGER DANGER (a little more punch in the transitions here and this song could have really taken off); the thoughtful and provocative sound in “Angel” (I can hear this song breaking radio play during this time); the soulful elements in “Eyes of Steel; the catchy energy in “Shadow from the Light,” which is a bit meatier than some of the other songs, and where you can really feel them hitting a solid songwriting stride with this track, the feel-good harmonies in “Easy Way Out,” and the closing “Secrets,” which has a nice mixture of acoustic and electric guitars in a really pretty melody. Overall, I am glad that Divebomb released these tracks from BUGZY, so that the AOR/Hard/Melodic Rock world will be able to hear some real gems here. The songs have a lot to offer, and there are some very memorable moments here that I know you will enjoy. 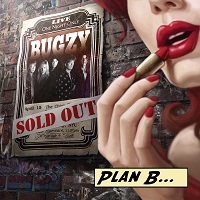 I am guessing that the album title “Plan B” is a tongue-in-cheek rebuttal to the fact that this was not the plan they had in mind when composing the material back in the 80’s and 9o’s. Who knows…maybe the band will come together again as has been happening lately with other defunct groups and make another go at it?